DePaul University has redefined the idea of a university from a place where you think, are challenged, engage in rational discussion and search for the truth. Instead, DePaul University has constructed a campus composed of the close-minded, politically correct and fraidy cats. It has tried to convert its entire campus into a "safe space" where feelings won't be hurt, orthodoxy and prescribed thinking are accepted mindlessly and the search for truth is submerged in a sea of restrictions on free thinking, free expression and free speech. Let's get this straight: Turning Point USA is not a provocateur. It advocates for freedom and the free market--ideas that are mainstream except, apparently, at DePaul where the administration fears that those principles will spur disruption and violence. Also, it is the responsibility of the university to provide security for speakers of all stripes. Charging the speakers a speech tax for security--apparently DePaul's policy--discriminates against ideas and groups that don't have the financial backing that whether groups do. The outside speaker policy at Chicago’s DePaul University vests a single DePaul administrator with broad powers to reject any campus speaker based on the content of his or her speech. The policy runs afoul of thefree speech promises DePaul makes to its students and faculty. You can send DePaul a message by attending Kirk's and Owens re-scheduled appearance at 7 p.m. tonight (Oct. 16) at J.W. Marriott Hotel, 151 W Adams St, in Chicago. If you go, note that the only disruption and possibly violence will come from the left. It has also denied official recognition to a student group that favored liberalized marijuana laws, and required the DePaul Socialists to pay for security guards before they could host a guest speaker. The event is set for 7 p.m. Tuesday at the JW Marriott Hotel on Adams Street. I agree that DePaul's policy of censorship is incompatible with the concept of a university which includes in its very essence freedom of thought and freedom of speech. While there may be legitimate concerns in particular cases, a university should make every effort to expose its students to as wide a spectrum of ideas as possible. 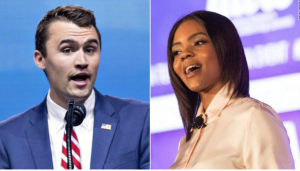 Charles Kirk and Candace Owens deserve to express their points of view. To prevent them from doing so, no matter how sophomoric and even repugnant their words may be, is unworthy of any institution of higher learning that calls itself a university..